It's now over 24 hours since I wrote my last blog. Azerbaijan may have won the European Song Contest but believe me I wouldn't recommend it as a holiday destination. The only cheering we experienced was all the clapping from the passengers when we finally touched down safely. 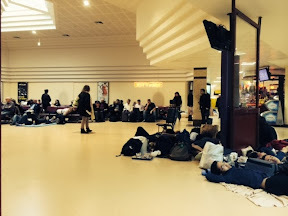 We were confined to that awful lounge at Baku airport in Azerbaijan for nearly 18 hours. And did the hours drag! Nothing to do except to periodically go to the toilets. As this country is not a Singapore Airlines destination they have no ground staff there at all. We were surrounded by suspicious looking black coated men - most of them looking like Joseph Stalin! Colour relief was supplied by small squads of very smart green-clad military attired men and women bedecked in badges and high peaked caps who periodically marched through the lounge. No one could tell us anything about what was to happen. The large cabin crew knew as much as we did. So we waited and waited. Finally a few bits and pieces were unloaded from the aircraft such as water and a few blankets and pillows. Although if anyone was caught taking photographs in the airport departure lounge they were made to delete them all. But I managed a discreet shot from our (very uncomfortable) metal chairs. 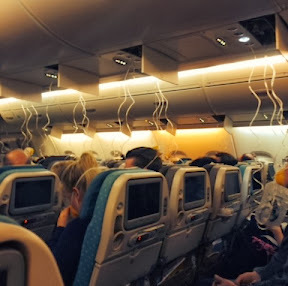 See how some of the passengers slept on the floor. No carpets here. We tried to lay out on the chairs but very little room as 400 passengers from the aircraft were spread around the hard floor of the lounge. Finally about twelve hours later three Singapore Airlines staff were flown in from Istanbul and Moscow (they needed to be fluent in Russian.) At last we had some news. A replacement aircraft was to be flown out from Singapore to pick us up. The arrival times kept changing as all sorts of permissions had to be sought from several Russian satellite countries. And the journey from Singapore to Azerbaijan would take 9 hours anyway. Then one of the SIA staff told us they'd paid $US60,000 to get us all visas - so we could get out of the airport and into hotels for a few hours. Wish they'd never taken the trouble as now we were facing communist style organisation. First the enormous queue to get a stamp in our passports from immigration. Then another even longer queue to be issued with visas (400 people each getting individual visas all filled in laboriously by hand from just three men). We were among the lucky ones as we were near the front of the queues and the whole process only took about an hour and a half. (Some were in 3 hour queues). So we were assigned hotels for a 3 or 4 hour stay to freshen up and have a meal. Business class passengers went to the Sheraton but our hotel was quite a way from the airport. Baku is quite a big city with many very large nice looking buildings (what we could see of them in the dark) but after passing some streets we recognised as having gone past twice before we realised at this stage that our driver was lost! However he eventually found a knowledgeable vehicle to follow. Hotels in Azerbaijan, we soon found out, first need to photograph passports before issuing keys to the rooms. Together with the queues this can take hours to check in. It took us a surprisingly quick time of less than an hour (but the Airline crew took nearly 3 hours from arriving at their hotel to getting to their rooms!) At least we had a chance to have a shower, but as we had no spare clothes had to get back into the same clothes we'd been wearing for the past 24 hours or so. The meal was awful too. 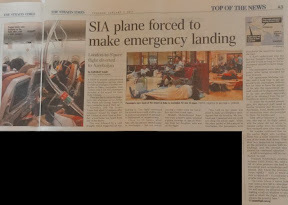 The emergency was big news in Singapore of course, and here is a cutting from today's Straits Times newspaper. Now, after a pleasant 3 hour flight we are in Bali and I'm writing this at one in the morning. Of course I blame all this on my young friend! (Only joking). I noticed that when we started our journey from England she'd set her watch to Singapore time. I told her that in all my 50 years of travelling I never change the time on my watch till actually touching down at the destination. It's bad luck to do otherwise! However, I've been thinking back over the last few days and realised that having survived two serious car crashes in Singapore, been brought back from the brink after catching the super-bug - C.Difficle in Budapest, recovered from three major cancer operations - one bowel and two lung, and now this, I reckon I've used up seven of my nine lives! So, in conclusion, I'll post a final image of what the most recent experience was all about. I can assure you my next blog will be very different to the last two!